The Cumberland River is located in south central Kentucky, just across the state line. ﻿The tailwater begins at the foot of Wolf Creek Dam near the town of Jamestown KY. We often describe it as three hours from everywhere. Nashville TN, Knoxville TN, Cincinnati OH etc. The river flows through miles and miles of gorgeous rolling hills, sheer rock bluffs, and large farms. Some of the best guided fly fishing in the southeast is found here. The unique location of the Cumberland River is one of the things that sit it apart from other great rivers. The Cumberland River valley is peaceful country, lacking the hustle and bustle of big towns. Burkesville is the only town along the river, and it's a modest sized town for a county seat. 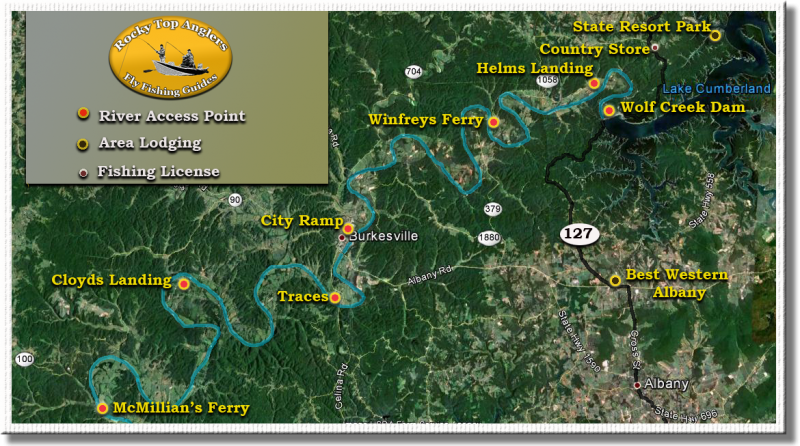 Burkesville offers lodging, dining, fishing license, and groceries. This area of KY is dry and offers no alcohol sales. The tailwater trout section is over 75 miles long and the entire fishery is protected with special slot limits and regulations. Add this to a fertile river valley and you come up with an incredible fishery that's filled with very nice population of trophy sized trout. ﻿The river is broken up itno many different sections. The distances between boat ramps can very from 4 to 18 miles. You seldom feel crowded with so much water to explore. Our most common trips take place on the upper 30 miles of the river. Releases from Wolf Creek Dam travel downstream between 2 and 4 miles per hour depending on rate of flow. Reading the flow schedules properly to find the right water levels on the tailwater can be tricky. 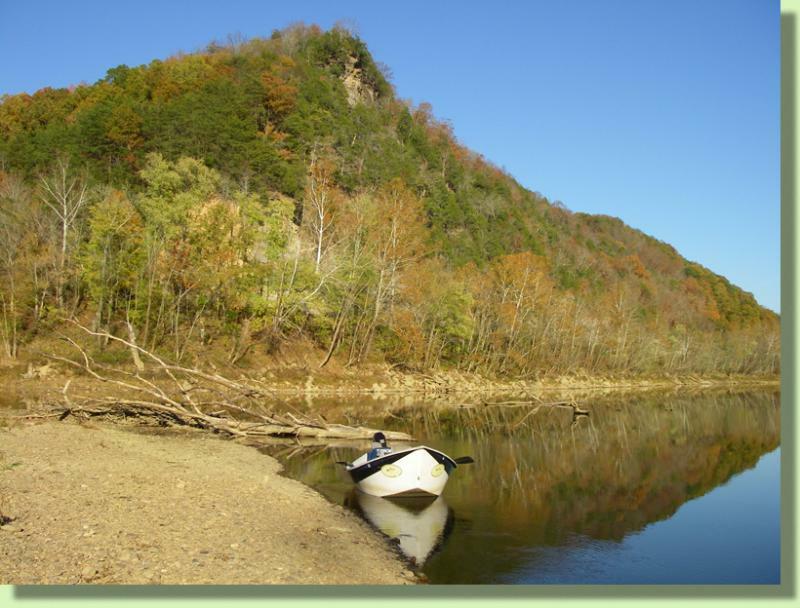 Rocky Top Anglers has spent many years learning the ebb and flow of the Cumberland River. 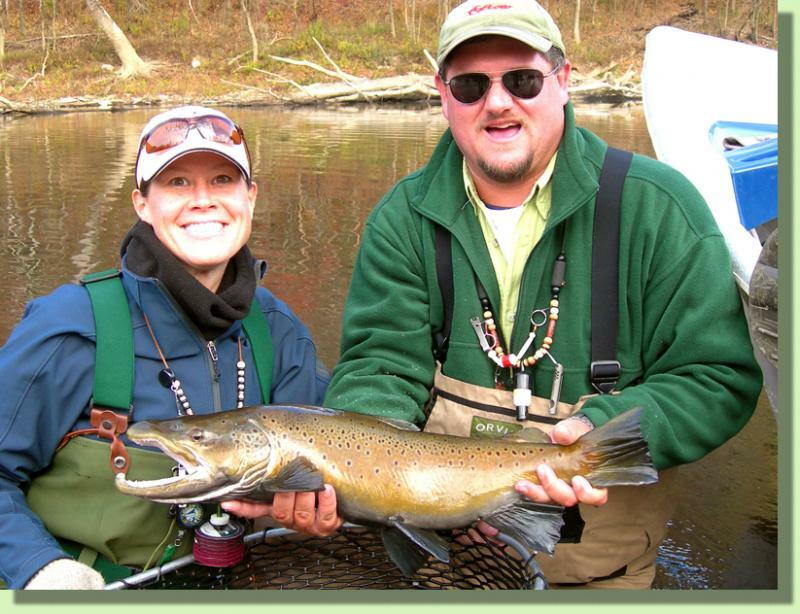 Our fly fishing guides are well versed on all float sections of the Cumberland River. The river hosts a lot of bug activity including midges (year round), stoneflies (late winter & spring), caddis (Spring and fall) and mayflies (summer & fall). Sow bugs and scuds are present in fishable numbers, especially in grassy areas. The summer season brings excellent terrestrials, including beetles, hoppers and cicadis. The fishing techniques on the Cumberland River can vary greatly from one day to another. Some times from hour to hour even. Nymph fishing using standard weighted nymphs and strike indicators is very popular. Dry fly and streamer fishing can also be very important at times. Five to six weight rods handle most situations well enough. Serious streamer fishermen will want eight weight rods or heavier to battle the large trout and striped bass. 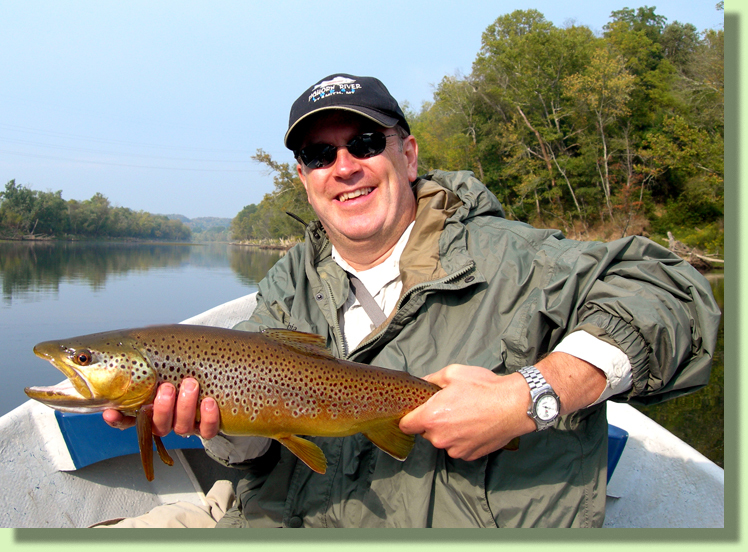 The Kentucky Deprtment of FIsh and WIldlife Resources manages the Cumberland River as a trophy brown trout fishery. Regulations allow one brown trout over 20 inches a day to be harvested. Rainbow trout also have some protection. All rainbow trout between 15 and 20 inches must be released. Five rainbow trout under 15 inches may be kept. A lot of anglers practice catch and release anyway, but these regulations help promote an impressive fishery. Kentucky might not be the place to go if your looking to catch a hundred fish in a day. It is however the place I reccommend visiting if your hoping to catch a trophy brown trout. Copyright 2011 Rocky Top Anglers. All rights reserved. Rocky Top Anglers is a professional fly fishing guide service located in east Tennessee. Our Fly Fishing Guides, Rocky Cox and Doug Moore offer guided fly fishing trips on all of the top tailwaters in east Tennessee. Guided Fly Fishing Trips on the Hiwassee River are performed in whitewater Drift Boats by our Qualified Fly Fishing Guides. We offer great Float Trip adventures with the Fly Rod on Clinch River. Fly Fishing Guide trips on the Holston River can be a very rewarding way to enjoy spring dry fly fishing in east Tennessee. 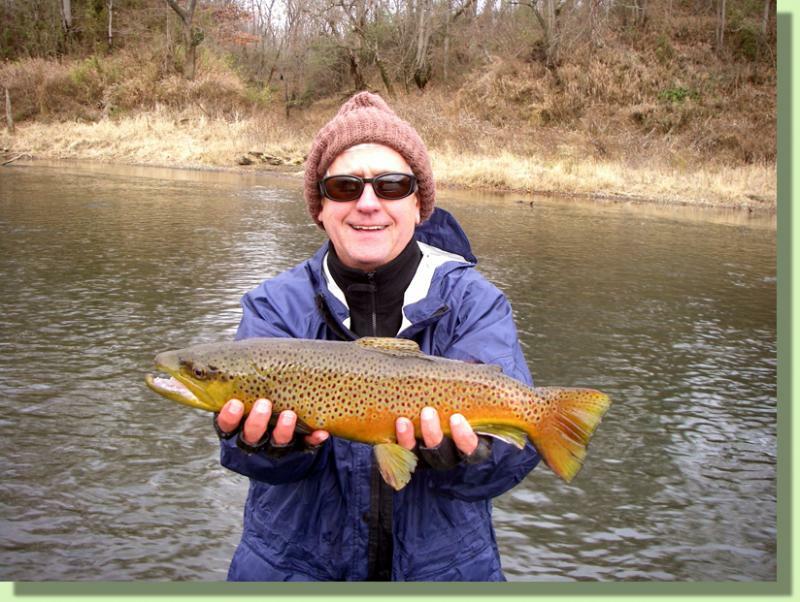 Rocky Top Angler employs Qualified Fly Fishing Guides with years of experience on all the Tennessee Tailwaters, including the Clinch River, Hiwassee River, Holston River, South Holston River, Watauga River, Caney Fork River, and Cumberland River. We often find Trophy Rainbow and Brown Trout on our Guided Fly Fishing Trips. Rocky Top Anglers employs many techniques, including Dry Fly Fishing, Nymph Fishing, Streamer fishing, and Emerger Fly Fishing for Trophy Rainbow and Brown Trout. Spring Time and Summer Fly Fishing on East Tennessee Trout Waters can be incredible. Hiring the right Fly Fishing Guide for your East Tennessee Fly Fishing Adventure can be important. Our Fly Fishing Guides are well skilled with Beginners, weekend warriors, and the veteran anglers. We've been in the Fly Fishing Guide busieness for many years and have 1000's of trips under our belts. Our site has current Fly Fishing Reports for East Tennessee and surrounding areas, including all the Fly Fishing Rivers near Knoxville, Nashville, and Chattanooga. Visitors to the area attractions such as the Pigeon Forge, Gatlinburg area are often surprised to find such incredible Trophy Fly Fishing for trout. We're here to show everyone what great Fly Fishing we have here in East Tennessee. Captain Rocky Cox has been guiding Fly Anglers for well over ten years. Growing up near the Clinch River, Holston River, Hiwassee River, and other East Tennessee Tailwaters has provided us with fabulous tailwaters to pursue Trophy Rainbow and Trophy Brown Trout. Come visit us when your visiting the east Tennessee area and you'll find we have been blessed here with Trophy Trout Fisheries, fine Fly Fishing, and great Fly Fishing Guides at Rocky Top Anglers.